The Arfak Mountains are situated at the northeast side of the Birdshead Peninsula. The mountains are of a rather moderate altitude with peaks up to 2940 meters (Mount Mebo). 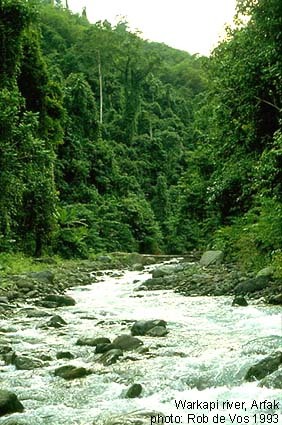 It is amazing that nature is so wealthy and rather undisturbed in the vicinity of a big city like Manokwari. 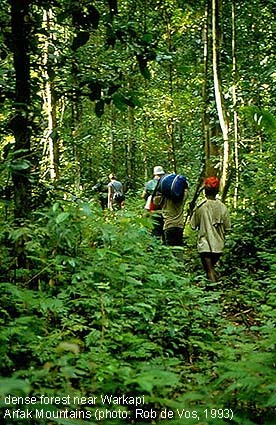 Moreover, at the very northwestern edge of the city is The Meja Reserve, a rather small National Park on top of Mount Meja ("Table Mountain"). Although there is high pressure on the protection of the surrounding nature by civilization (traffic, industry, logging), the Arfak Mountains are spared until now. With its rather steep mountain slopes and deep cloves it seems not interesting for industrial exploiration yet. Most important cultivated areas are situated at the east coast of the Birdshead Peninsula. 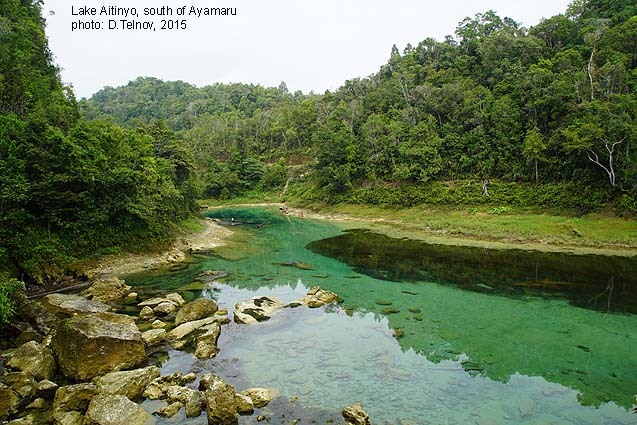 In the north the big city of Manokwari is settled, more south Andai, Warkapi, Oransbari and, at the southernmost point of the Arfak, Ransiki. 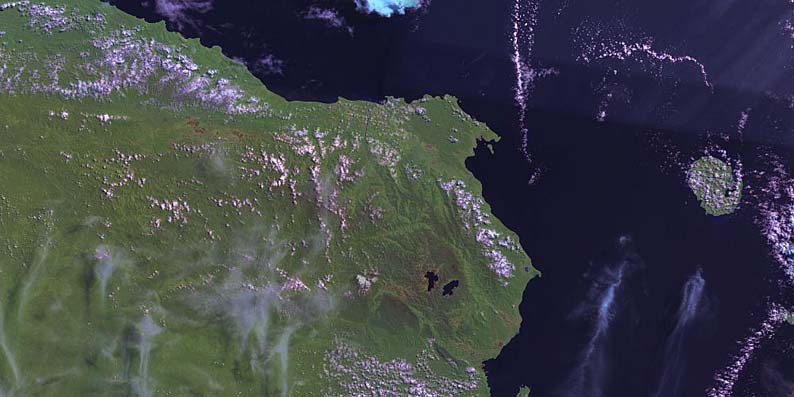 Manokwari is the largest city in this area and is the second largest city of Papua and inhabits an university. Next in row at the east coast is Ransiki. It has a small industry and fishery harbour. In the Central part of Doberai Peninsula, at the westside of the Arfak Mountains, the landscape is more flat and includes many marshes, slow running rivers and small ponds and lakes. It inhabits a rich fauna of water insects (dragonflies, beetles, a.o.). 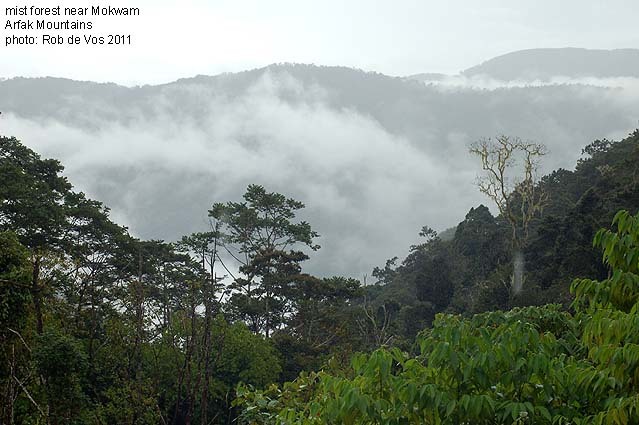 At the edges of the mountain area we found some palm-oil plantages (near Andai and Prafi) and areas with secundairy forest, but somewhat deeper in the mountains are still wide areas of primary forest, where the flora and fauna is rather undisturbed. 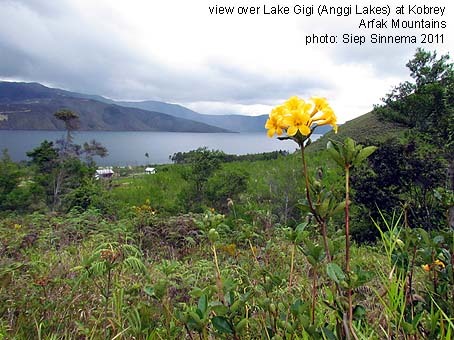 High in the mountains are the two Anggi Lakes, Gigi and Gita. The Arfak Mountains inhabit a very rich biodiversity for several fauna elements, like birds and insects, with many endemic species. It definitely needs to be protected as a nature reserve. 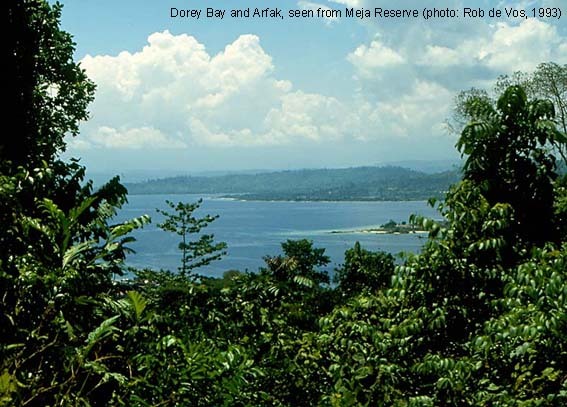 1826 - Dumont D'Urville visits the Dorey Bay (where at present Manokwari is settled) and meets for the first time Arfak people. He is passenger on the ship D'Astrolabe of L.J. Duperrey. 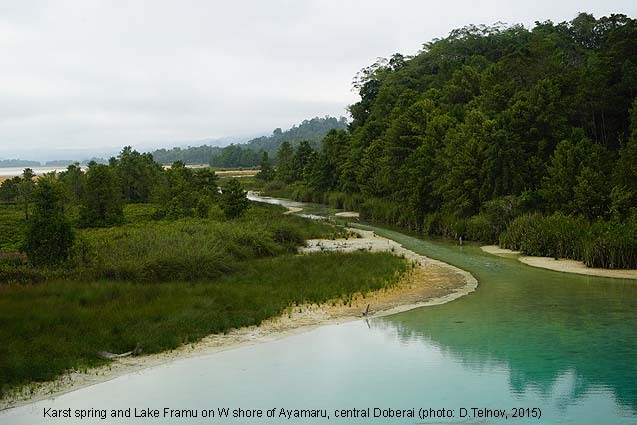 1858 - Alfred Russel Wallace spents a few weeks at Doré (now Manokwari), collecting birds and insects. His collectors go in the Arfak Mountains. He also collected at the North coast of the Birdshead Peninsula. 1872 - The Italian naturalist L.M. D'Albertis makes a trip from Andai to Mt. Hattam (Arfak). 1873 - The German A.B. Meyer, from the Zoology Museum in Dresden, visited Dorey Bay and collected lepidoptera. He also visited Manem (now Mansinam). 1875 - The Italian naturalist O. Beccari climbes in the Arfak Mountains and reaches Mt. Hattam (2040 m). 1877 - The French naturalist L. Laglaize visits the Karoner, Amberbaker and Kebar people at the Northcoast of the Birdshead Peninsula. 1883 - 1884 The French naturalist F.H.H. Guillemard visits the Birdshead Peninsula. He collected birds, butterflies and other insects. 1889 - For 9 years the German collector H. Kühn collected in New Guinea and the adjacent islands. 1891 - The Swiss Hans Fruhstorfer visits the Birdshead Peninsula and collected many lepidoptera. His material is still preserved in the BMNH and ZMHB. 1892 - The English animal collector W. Doherty collected many birds and insects, of which mostly butterflies. He visited Andai and Dorey. 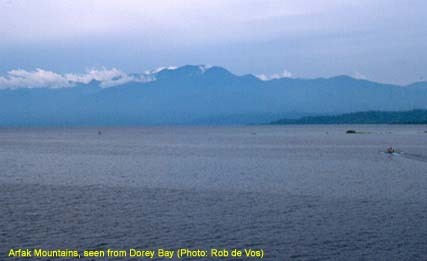 1896 - Doherty visits New Guinea for the second time, visiting Dorey Bay. 1896 - Zoologist E.St. Vraz explores the Arfak Mountains and reaches up to 20 km South of Mt. Hattam. 1907 - A.E. 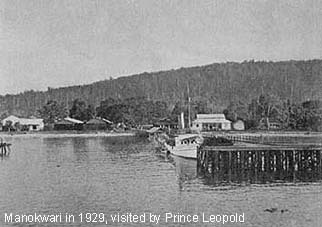 Pratt visits, together with his two sons Felix and Charles Pratt, the Arfak Mountains near Manokwari. 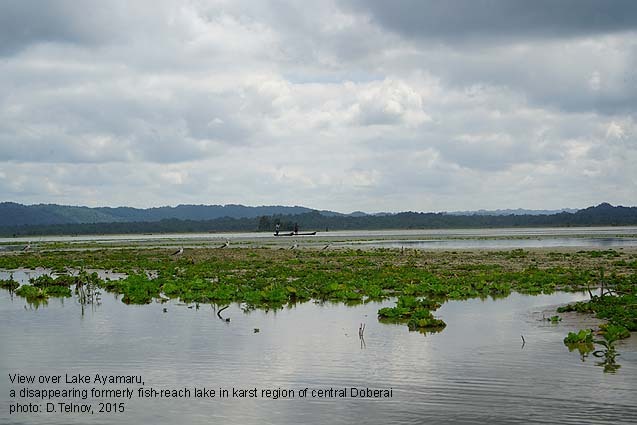 Charles also visited Warmasin (Anggi Lakes, Arfak Mountains, February 1909). Both brothers, Felix and Charles went on the River Uty and Mt. Misresi in the Arfak Mountains. 1913 - A.E. Pratt and his two sons Felix and Charles plan a new trip to the Anggi Lakes in the Arfak Mountains. 1914 - In order of J.J. Joicey (owner of the private Hill Museum) A.E. Pratt and his sons collected in the Arfak Mountains. 1928 - Ernst Mayr, a German ornithologist, collected birds, mammals, plants and insects on the Birdshead Peninsula, mostly from the Arfak Mountains. 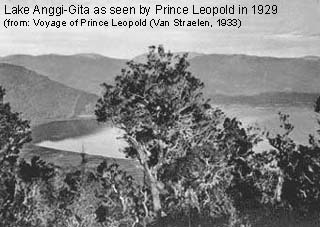 1928-1929 - From December 1928 till May 1929 Prince Leopold from Belgium visits the Dutch Indian Archipelago. He also visited the Arfak Mountains. Apart from other animals he collected also insects ((type)material in ISNB, Brussels). 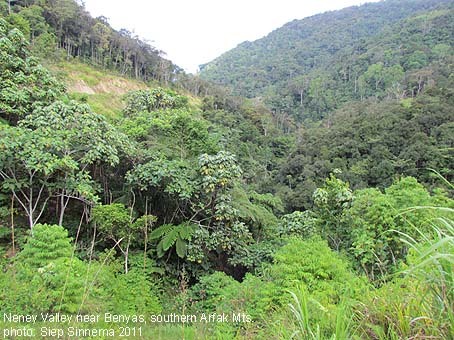 1993 - Expedition of the Zoological Museum of Amsterdam to Manokwari, Meja Reserve, Prafi and Warkapi (Arfak), by Arnold de Boer, Twan Rutten and Rob de Vos. 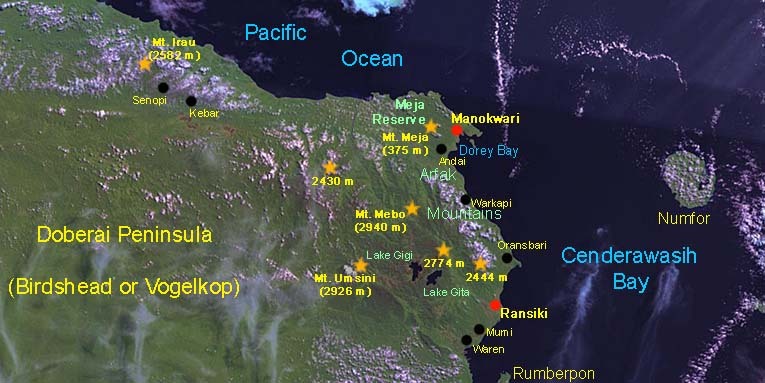 1996 - Expedition of the Zoological Museum of Amsterdam to Manokwari, Meja Reserve, Andai, Prafi and Ransiki (Arfak), by Arnold de Boer, Gerrit Withaar, Piet Zumkehr, Herman de Jong and Rob de Vos.